You may assume that the idea of kicking out Syrian dictator Assad is a recent idea stemming from his brutal crackdowns on protestors starting in March 2011. The CIA backed a right-wing coup in Syria in 1949. A CIA officer involved in the coup has written several books about it. In 1956, NSA and CIA officials penciled out “Operation Straggle” to implement a US-backed “anti-communist” coup in Syria. In 1957, the CIA planned another coup, code-named “Operation Wappen”. After the coup attempt was exposed, the US government and media began describing Syria as a “Soviet satellite”. One intelligence report suggested that the USSR had delivered “not more than 123 Migs” to the country. Reporter Kennett Love later said that “there were indeed ‘not more than 123 Migs’. There were none.” In September 1957, the US deployed a fleet to the Mediterranean, armed several of Syria’s neighbors, and incited Turkey to deploy 50,000 troops to its border. Secretary of State John Foster Dulles suggested that the US sought to invoke the “Eisenhower Doctrine” of retaliating against provocations, and this intention was later confirmed in a military report. No Arab state would describe Syria as a provocateur, and these military deployments were withdrawn. Covertly orchestrating simultaneous military threats against Syria from three border states hostile to Syria: Iraq, Israel and Turkey. Consideration must be given to orchestrating a credible military threat against Syria in order to induce at least some moderate change in its policies. CIA documents show that, in 1986, the CIA drew up plans to overthrow Syria by provoking sectarian tensions. Weakening, containing, and even rolling back Syria …. The proposed re-division of both Iraq and Syria is broadly modeled on that of the Federation of Yugoslavia which was split up into seven “independent states” (Serbia, Croatia, Bosnia-Herzegovina, Macedonia (FYRM), Slovenia, Montenegro, Kosovo). 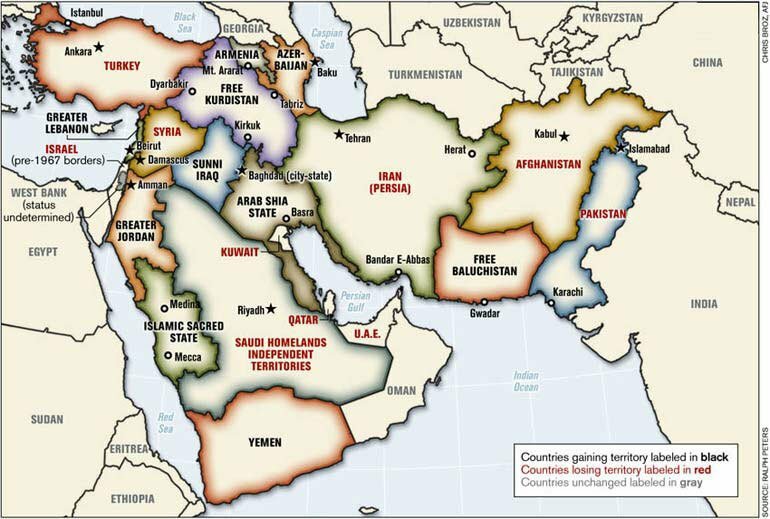 According to Mahdi Darius Nazemroaya, the re division of Iraq into three separate states is part of a broader process of redrawing the Map of the Middle East. We believe [Syrian leader] Bashar’s weaknesses are in how he chooses to react to looming issues, both perceived and real, such as the conflict between economic reform steps (however limited) and entrenched, corrupt forces, the Kurdish question, and the potential threat to the regime from the increasing presence of transiting Islamist extremists. This cable summarizes our assessment of these vulnerabilities and suggests that there may be actions, statements, and signals that the USG can send that will improve the likelihood of such opportunities arising. Roebuck argued that the US should try to destabilize the Syrian government by coordinating more closely with Egypt and Saudi Arabia to fan sectarian tensions between Sunni and Shia, including by the promotion of “exaggerated” fears of Shia proselytizing of Sunnis, and of concern about “the spread of Iranian influence” in Syria in the form of mosque construction and business activity. The U.S. started funding the Syrian opposition in 2006 … and arming the opposition in 2007. I was in England two years before the violence in Syria on other business. I met with top British officials, who confessed to me that they were preparing something in Syria. This was in Britain not in America. Britain was preparing gunmen to invade Syria. Indeed, the U.S. has carried out regime change throughout the Middle East and North Africa for many decades.